We’ve all heard the old adage, “strike while the iron is hot,” which is the strategy many financial experts are taking towards precious metals — especially gold. If you don’t already have gold as a part of your retirement portfolio, read on to learn why those in the know believe gold will rally in 2016. Last month, we profiled billionaire George Soros’ migration away from stocks and towards gold. Why should we listen to his prediction? Soros is one of the richest men in the world, and in 1992, made a $10 billion bet that the British pound would experience a dramatic drop in value. Soros was right. The pound had one of its biggest declines in history, an event that came to be known as “Black Wednesday.” Now, Soros is predicting that the value of stock markets will fall and the value of gold will rise. He points to what he believes to be the inevitable fall of the Chinese market, an event that would dramatically impact the price of gold. Another investor confident about gold is DoubleLine Capital CEO Jeff Gundlach, who predicts gold could go as high as $1400 per ounce. One of the biggest hot-button issues in the world right now is the succession of Britain from the EU, known as Brexit. CNBC reports that Boris Schlossberg of FX Strategy for BK Asset Management believes gold is a “risk-haven repository,” a buffer against financial turmoil. Recent announcement from the Fed sent bond prices plummeting, which in turn caused gold to rise to $1307 per ounce in early June. The word on the street is interest rates won’t go up until at least December. What does this mean for gold? While some investors believe that an interest rate hike would be bad for gold prices, others beg to differ. History shows us that after the last four interest rate hikes, gold prices actually went up. This puts investors in an attractive position; there’s still ample time to buy gold before the potential rate rise. Gold has a favorable track record and is an investment with global liquidity, which is just one more reason why experts are currently recommending this precious metal. 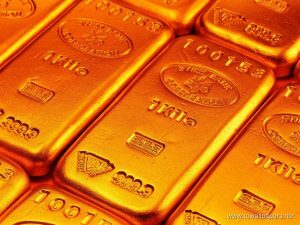 One of the most appealing things about gold is that there are a variety of ways in which to invest. In addition to e-Gold and gold ETFs, there’s the Gold IRA. There are a number of reasons why you should consider the Gold IRA as part of your retirement strategy. The most important one is that it is the only one provides true diversification since it is not a paper asset like the e-gold or gold ETF, you own physical precious metals, coins or bars of your choice. Conversion from a traditional IRA or a former 401K with paper assets to Gold IRA is very simple with American Bullion. Want to learn more? Check out our free Gold IRA Guide for Beginners, which can help you make a more informed decision when it comes to investing in gold.